This week we have welcomed some new faces to our farm. We now have two Polish chickens who are about nine months old. We also have a new buddy for Ziggy our pot-bellied pig, and her name is Peanut. Peanut is about five months old, and she loves to eat apples, do tricks, and get her belly rubbed. Our baby chicks are now outside in their new chicken coop, and they are getting big really fast! Many staff members at Pathfinder went to conferences this week. One conference was the American Camp Association (ACA) in Palm Springs, where some of our staff got excited and ready for summer camp. 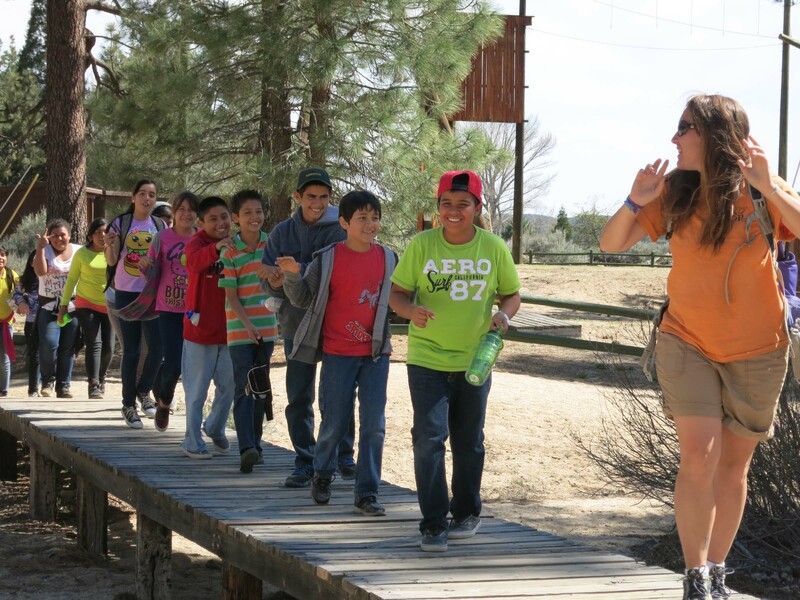 The other conference was a much further drive to Sonora, CA at the Sierra Outdoor School where the Association for Environmental and Outdoor Education (AEOE) annual spring conference was held. We had a lot of fun going to awesome workshops, networking with other naturalists and outdoor schools, and exploring a new part of California. This Spring has been absolutely beautiful here at Pathfinder Ranch. 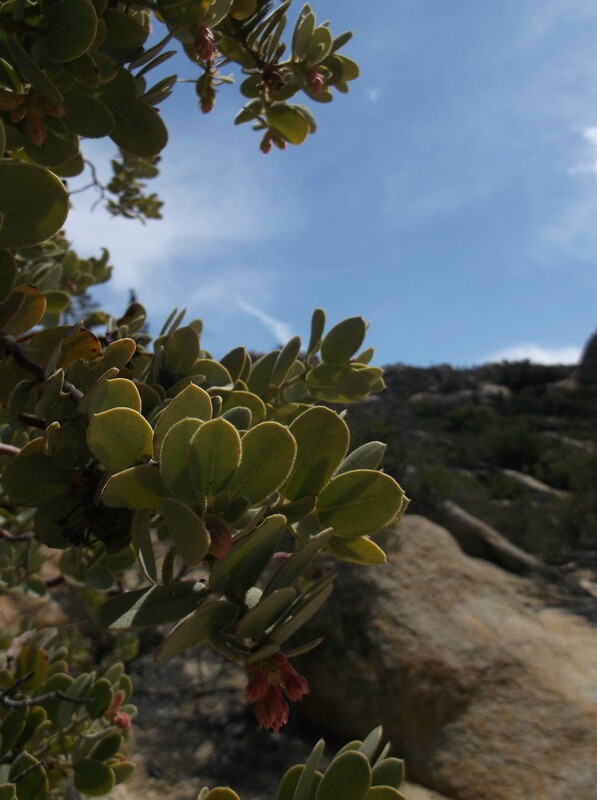 The Manzanita shrubs are starting to bud along the trail, and we even heard the frogs start croaking along the waterfall! In addition, the extra sunlight shining through to our nature center is causing our ectothermic (cold-blooded) reptilian friends to be more active. 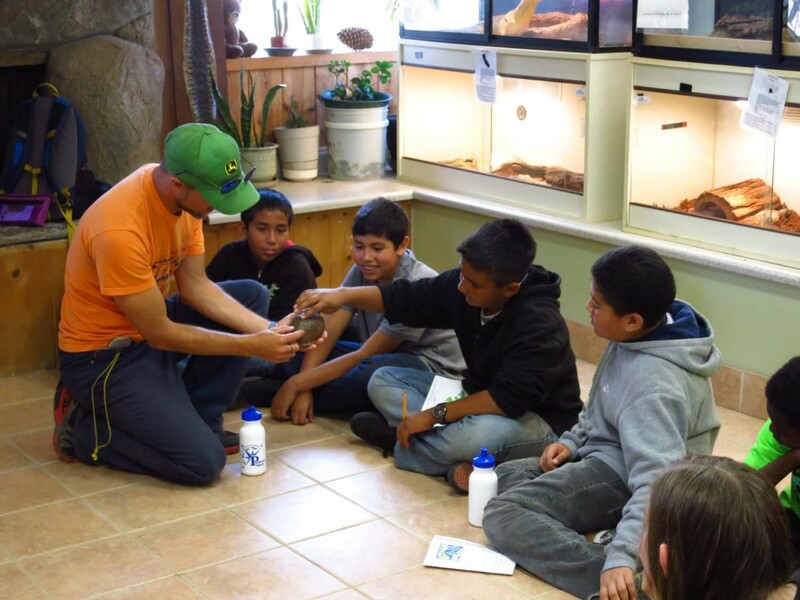 They have been helping us to show that reptiles are not slimy or creepy creatures, but instead, animals with amazing adaptations! In fact, snakes can eat prey that is much larger than their heads. They can do this because their jaw is attached to their skull by strong ligaments, and the lower jaw can come apart from the upper jaw. This allows many snakes to open their mouths up to 150 degrees! That’s quite a yawn. As a comparison, humans can only open our mouths to 45 degrees! We’ve been very fortunate to have clear skies for astronomy the past couple of weeks! The students were able to see Jupiter and its four Galilean moons, but did you know that Jupiter has a total of sixty moons?! We just can’t see them all in our telescopes. If the night sky intrigues you there is a cool website called Earth Sky/Tonight, and it tells you fun facts about the night sky and what you can look for. Check it out! Some students even had a full moon to light up their night hike last week, which is when they learned about nocturnal adaptations that animals have to help them survive in the dark. While some students found their way through the darkness on their hike, others were at campfire where talents were abundant. I think that American Idol should be looking for talent at Pathfinder campfires with all the talented individuals that have come through here! I can’t wait to meet all of the new students next week and find out what their interests and talents are! 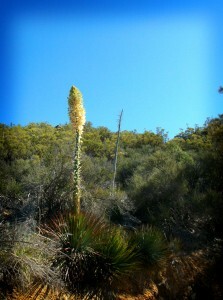 The yuccas are sending up their edible stalks that are blooming with flowers that can also be eaten. Not only have the plants around Pathfinder been busy the past few weeks—we enjoyed the company of five schools over ten weekdays. With so many smiling faces about it is no surprise that the plants would find their own way to smile back. Our garden is coming into its own as well. We are harvesting mustard greens, spinach, and arugula every week. The mint in the herb spiral is starting to take over, but we will hold it back to make room for the basil seeds that have just sprouted in the staff house. There was a bit of worry about the seeds we planted just two short weeks ago. They had spent an entire year in our greenhouse that has temperatures far exceeding 100° F. throughout the summer. We shouldn’t have fretted, however, because most of the seeds have already sprouted. 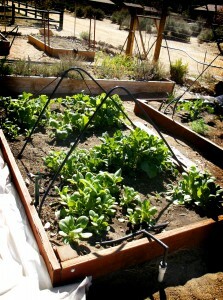 Planting a backyard garden is something we recommend that you do at your home. You don’t even need a yard, container gardening works well, too. When I lived in a city I grew all of my vegetables on my roof in pots! Here is a great resource for container gardening. Try planting tomatoes and zucchinis. They are really easy to grow and can survive almost anything as long as you water them! It’s almost like summer here at Pathfinder Ranch. The temperatures have been reaching up into the mid 70s to low 80s during the day and dropping just barely below freezing at night over the last week or so. 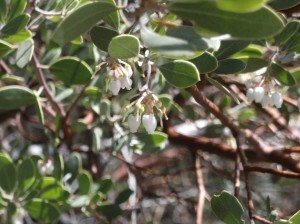 The manzanitas have been blooming for weeks, and the flowers are starting to drop off exposing small berries. It is the berry of the manzanita that gives it its name (meaning little apple in Spanish). In just a few short weeks the berries will be ready for picking. The dried berries can be ground into meal to be used for food, or they can be picked and eaten fresh. 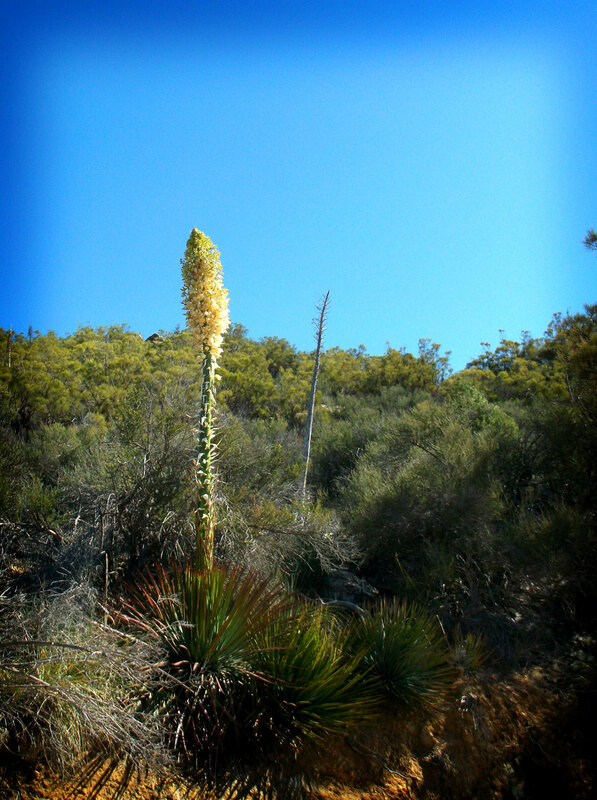 On April 6 there is an Agave Harvest off of Highway 74 just several miles from the ranch put on by the Malki Museum (the museum is located in Banning, CA). Go to their website at www.malkimuseum.org to find out more and to register to join in the harvest. One of our naturalists will probably be there joining in the fun. 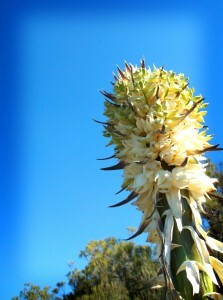 The Malki Museum will then teach how to roast the agave on April 13 at their location in Banning.